Bronchial provocation is often used to confirm asthma. Dyspnea sensation, however, associates poorly with the evoked drop in FEV1. Provocation tests only use the large airways parameter FEV1, although dyspnea is associated with both large- and small airways dysfunction. Aim of this study was to explore if adenosine 5′-monophosphate (AMP) and adenosine evoke an equal dyspnea sensation and if dyspnea associates better with large or small airways dysfunction. We targeted large airways with AMP and small airways with dry powder adenosine in 59 asthmatic (ex)-smokers with ≥5 packyears, 14 ± 7 days apart. 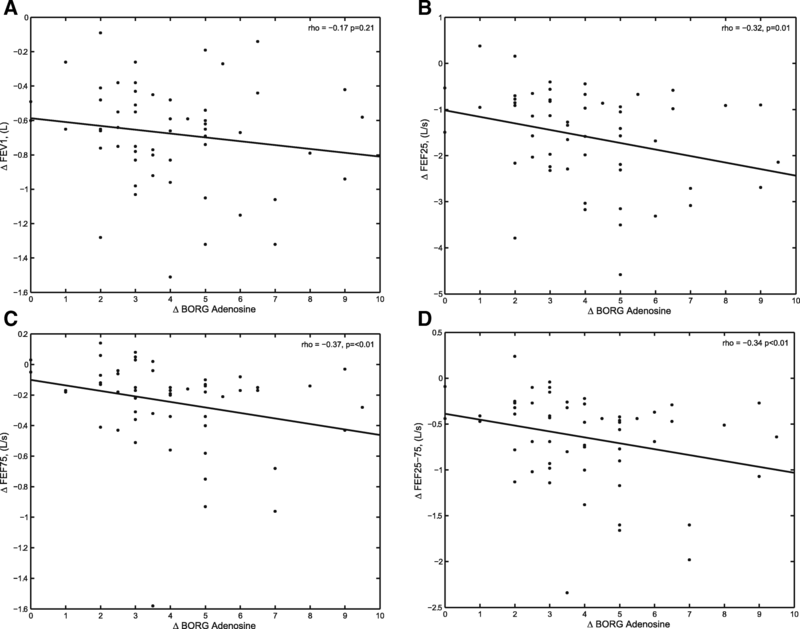 All subjects performed spirometry, impulse oscillometry (IOS), and Borg dyspnea score. In 36 subjects multiple breath nitrogen washout (MBNW) was additionally performed. 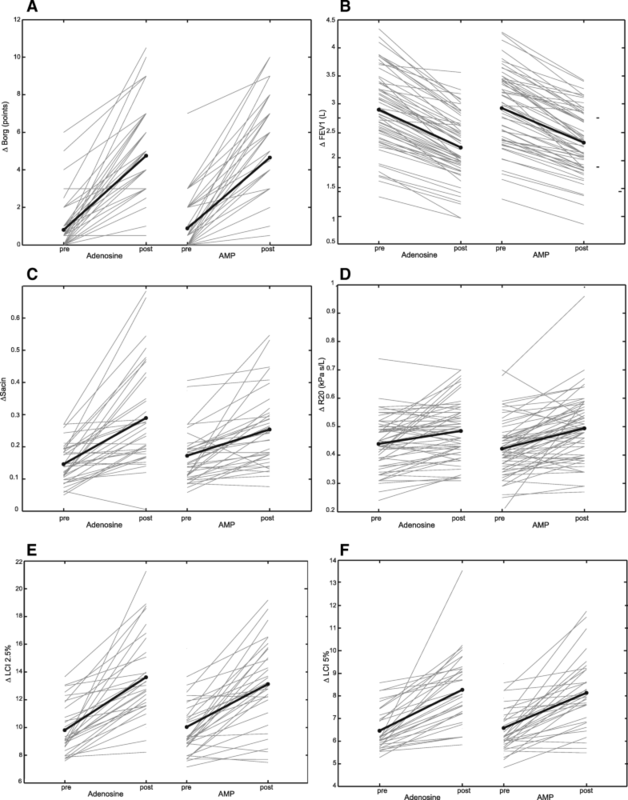 We analyzed the association of the change (Δ) in Borg score with the change in large and small airways parameters, using univariate and multivariate linear regression analyses. MBNW was analyzed separately. Provocation with AMP and adenosine evoked similar levels of dyspnea. ΔFEV1 was not significantly associated with ΔBorg after either AMP or adenosine provocation, in both univariate and multivariate analyses. In multivariate linear regression, a decrease in FEF25–75 during adenosine provocation was independently associated with an increase in Borg. In the multivariate analyses for AMP provocation, no significant associations were found between ΔBorg and any large or small airways parameters. AMP and adenosine induce equally severe dyspnea sensations. Our results suggest that dyspnea induced with dry powder adenosine is related to small airways involvement, while neither large nor small airways dysfunction was associated with AMP-induced dyspnea. NCT01741285 at www.clinicaltrials.gov, first registered Dec 4th, 2012. Airway hyperresponsiveness (AHR) is a distinct asthma characteristic. Bronchial provocation tests can be used to assess AHR, can help to diagnose asthma and monitor asthma control . However, the patient’s dyspnea perception associates poorly with the provocation test . In clinical practice, patients often experience dyspnea before the provocative agent causes the forced expiratory volume in the first second (FEV1) to drop 20% . On the other hand, others experience no dyspnea even when the FEV1 has dropped more than 20% . A provocation test is based on the FEV1, which is believed to be a marker for the larger airway . However, dyspnea sensation is associated with both large- and small airways dysfunction [6–8]. To evaluate the small airways, for example, the forced expiratory flow between 25 and 75% of the expiration (FEF25–75) or the difference in resistance between 5 Hz and 20 Hz (R5-R20) measured with impulse oscillometry (IOS) can be used . Provocation tests with subsequent IOS measurements have suggested that dyspnea induced with a provocative agent corresponds better to small- than to large airways dysfunction [3, 9, 10]. Provocation tests can be performed with either direct or indirect acting agents. Direct stimuli, such as histamine and methacholine, stimulate the airway smooth muscle, resulting in airway contraction . Indirect stimuli, on the other hand, induce the release of mediators from inflammatory cells, such as histamine, leukotrienes, and prostaglandins causing airway contraction . Examples of indirect stimuli are mannitol, nebulized adenosine 5′-monophosphate (AMP), and dry powder adenosine. The well-established AMP is dose restricted (as AMP becomes insoluble above 320–400 mg/mL) , whereas mannitol and the newly available dry powder adenosine are not . AMP and dry powder adenosine are well tolerated by patients , but mannitol evokes discomforting cough [16, 17]. AMP and dry powder adenosine appear to act via the same indirect pathways, but can consist of differently sized particles. Nebulized AMP commonly has a mass median aerodynamic diameter (MMAD) between 5.1–8.5 μm , depending on the nebulizer settings and AMP concentration [18, 19]. Dry powder adenosine, on the other hand, can be produced with an MMAD as small as 2.6–2.9 μm , with a much smaller distribution in particle size which is independent of the dose . Therefore, dry powder adenosine was postulated to reach the small peripheral airways to a larger extent compared to nebulized AMP, especially when inhaled at a low flow . Thus, to target the small airways specifically, without a dose restriction and cough, adenosine may be valuable. In this study we evaluated whether there is a difference between the perception of dyspnea induced with the assumed small airways trigger dry powder adenosine or the assumed larger airways trigger nebulized AMP. In addition, we evaluated for both triggers if the perception of dyspnea during a provocation test is more closely associated to changes in large- or small airways function. This study was performed with baseline data from the previously published OLiVIA study (clinical trial number: NCT01741285, www.clinicaltrials.gov) . Included subjects were asthmatics (doctor’s diagnosis), current or ex-smokers (> 5 pack years), aged between 18 and 65 years, and all had a preserved lung function (FEV1 > 50%predicted and > 1.2 L). Excluded were subjects with a recent (< 6 weeks) exacerbation or upper airway infection, females who were pregnant or lactating, and subjects with clinically unstable concomitant diseases. The screenings phase of the OLiVIA study incorporated two provocation tests. First an AMP provocation and 14 ± 7 days later a dry powder adenosine provocation, performed after a washout period of four to six weeks for asthma maintenance therapy and eight hours for short acting β2-antagonists (SABAs). In the Olivia study only subjects with hyperresponsiveness to adenosine (≥20% drop in FEV1 on < 20 mg adenosine) were included. In the current study, all subjects who performed both provocation tests were accepted, on condition that they experienced dyspnea (increase in Borg > 1) evoked by the challenge. Wet nebulized AMP (MMAD 5.1–8.5 μm)  was administered in doubling concentrations ranging from 0.04 to 320 mg/mL. The AMP solutions were inhaled during two minutes of tidal breathing, without a breath-holding period, using the APS Pro System (CareFusion) with the SideStream nebulizer (Philips Respironics) at an output rate of 0.13 mL/min. Consecutive concentrations were inhaled at five-minute intervals until the concentration caused the FEV1 to drop ≥20% (PC20) or the highest concentration was administered. Dry powder adenosine (MMAD 2.6–2.9 μm)  was administered in doubling doses of 0.04 to 80 mg. The powder was inhaled from functional residual capacity (FRC) to total lung capacity (TLC) at a low flow rate of 20 30 L/min guided by an inspiratory flow meter, as described previously . After each inhalation subjects held their breath for 10 s at TLC to allow for optimal airway deposition . The procedure was repeated at three-minute intervals until the administered dose evoked a ≥ 20% drop in FEV1 (PD20) or the highest dose was administered. Before and after each provocation test pulmonary function tests were performed. In all subjects spirometry and IOS measurements were performed to obtain parameters for large (i.e. FEV1, R20) and small airways (i.e. FEF25–75, R5-R20), using the classification from the review by Van der Wiel et al. . Due to availability of the measurement device, multiple breath nitrogen washout (MBNW) was only measured in a subset of subjects in one of the centers. MBNW provided the index for the ventilation heterogeneity of the acinar (Sacin) and conductive airways (Scond), and the lung clearance index (LCI). Before and after the provocation test dyspnea was assessed with the Borg dyspnea score , scoring dyspnea sensation from 0 = ‘no dyspnea at all’ to 10 = ‘maximal dyspnea’. All analyses were performed on the change (Δ) in a parameter induced by the provocation test; calculated by subtracting the pre-provocation value from the post-provocation value. To check if adenosine and AMP induced similar responses, we compared changes in parameters between the two tests with a two sided Student’s paired t-test or a two-sided Wilcoxon test, in accordance with the normality of distribution. 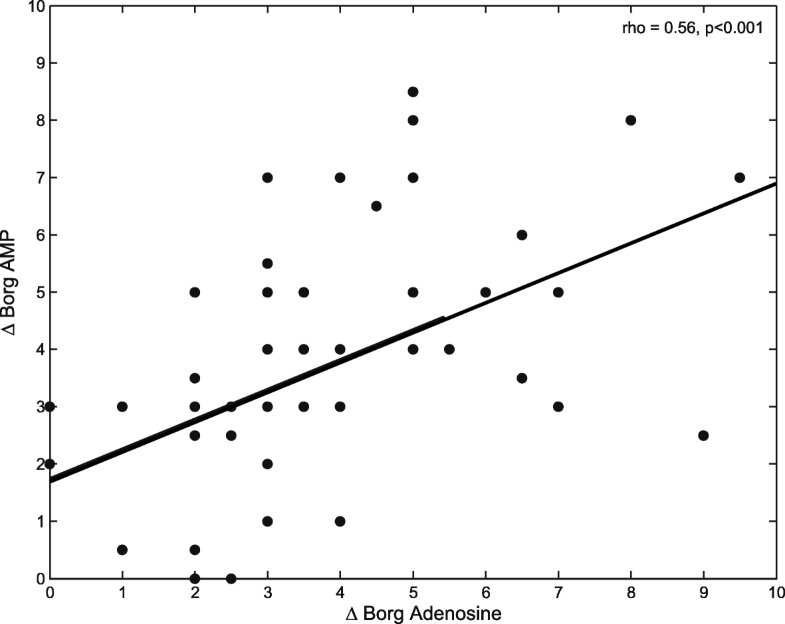 With Spearman’s correlation the change in Borg score (ΔBorg) was univariately correlated to the change in each parameter of spirometry, IOS and MBNW, for both AMP and adenosine. Subsequently, multivariate linear regression models were constructed, to investigate the origin of dyspnea. A large- and a small airways parameter from both spirometry and IOS, was selected for the model. The parameter had to have the lowest p-value in the univariate correlation analysis and were corrected for co-linearity (correlation < 0.7). Because of assumed clinical relevance, gender and smoking status were added to the model. Models were ran once without reducing or increasing the amount of parameters. As MBNW was measured in fewer subjects, a separate model was constructed expanding the models with the MBNW parameter with the lowest p-value. For this study 77 subjects were screened. However, 18 subjects were excluded as they were unable to perform spirometry or a provocation test adequately (n = 5), complete the medication washout period (n = 8), had chronic non-asthmatic respiratory diseases (n = 2), or had other unstable non-respiratory diseases (n = 3) . A total of 59 subjects underwent both provocation tests of which 36 performed a MBNW test. Baseline characteristics are shown in Table 1. Provocation with adenosine and AMP evoked a decreases in FEV1 of 23.4 ± 8% and 21.1 ± 8%, respectively. 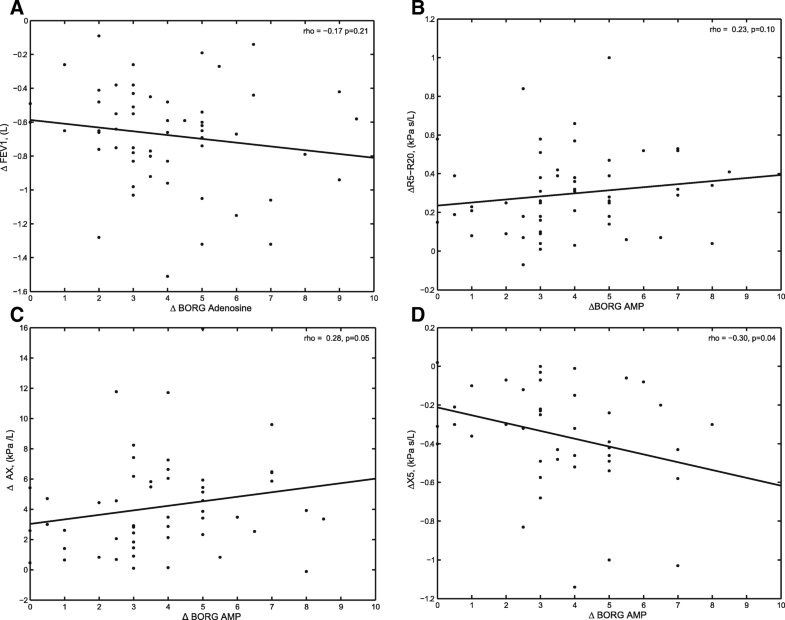 The severity of dyspnea evoked with adenosine and AMP was not significantly different, with an increase in Borg of 3.95 ± 2.1 and 3.77 ± 2.1 points, respectively (p = 0.65). Spearman’s correlation between ΔBorg after adenosine and ΔBorg after AMP was moderate (rho 0.56, p < 0.001) (Fig. 1). AMP provocation evoked a greater increase in R20 (p = 0.04) compared to adenosine, while adenosine evoked a greater increase in LCI2.5% (p = 0.03) and Sacin (p = 0.01) (Fig. 2). An overview of all comparisons is shown in (see Additional file 1: Table S1). In the univariate analyses, ΔBorg for provocation with adenosine was significantly correlated with ΔFEF25 (Ls− 1), ΔFEF75 (Ls− 1), and ΔFEF25–75 (Ls− 1) and showed a trend toward an association with the ΔFEF50 (Ls− 1) (Fig. 3). The ΔBorg for provocation with AMP was significantly associated with ΔAX (kPa L− 1) and ΔX5 (kPa sL− 1) and there was a trend towards a correlation with ΔFEV1 (L) and ΔR5-R20 (kPa sL− 1) (Fig. 4). Results of all correlation analyses are shown in (see Additional file 1: Table S2). The multivariate model for adenosine included ΔFEV1 (L), ΔFEF25–75 (Ls− 1), ΔR20 (kPa sL− 1) and ΔR5-R20 (kPa sL− 1) (Table 2). This model showed an independent significant, negative association of ΔFEF25–75 (Ls− 1) with ΔBorg (R2 = 20.9%). The model for AMP included ΔFEV1 (L), ΔFEF50 (Ls− 1), ΔR20 (kPa sL− 1), and ΔX5 (kPa sL− 1) (Table 2) and showed no independent associations to ΔBorg (R2 = 4.3%). In the subgroup analysis incorporating MBNW data, ΔScond was added to the adenosine model (Table 2). The result shows that ΔBorg had the best association with ΔFEF25–75 (kPa sL− 1), yet not significant (p = 0.09). The model incorporating ΔScond had an improved R2 (R2 = 26.5%). The AMP model with MBNW incorporated ΔLCI5% (Table 2), which shows no independent association to ΔBorg (R2 = 5.4%). We found that dry powder adenosine and AMP evoke equal increases in dyspnea sensation, with a similar decrease in FEV1. 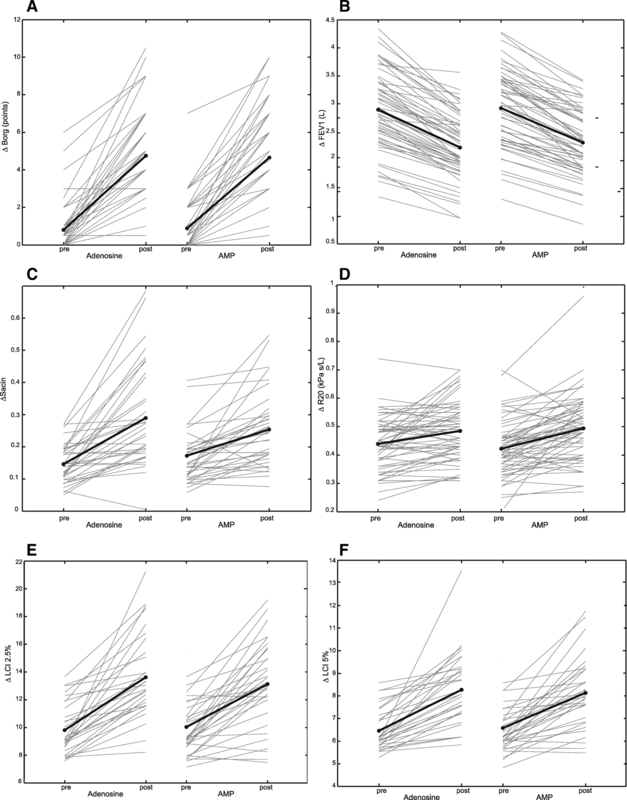 However, during adenosine and AMP provocation, the increase in dyspnea sensation was differentially associated with large- and small airways dysfunction. The only independently association with dyspnea induced by dry powder adenosine was the decrease in FEF25–75, whereas dyspnea induced by AMP was not associated with changes in either large- or small airways dysfunction. Our aim was to selectively target the small airways with dry powder adenosine. Therefore, we expected that dyspnea induced by dry powder adenosine would associate primarily with small airways parameters. Our findings were partly in line with this as we found the increase in Borg dyspnea score after inhalation of adenosine to associate with the decrease in FEF25–75, both in the univariate and multivariate analysis. However, the adenosine-induced change in other small airways parameters, such as R5-R20, Scond and Sacin, did not associate with ΔBorg. This was in contrast to our expectations, as these parameters are considered to be measures of the more peripheral small airways. A possible explanation could be that the measurements provide different information, yet there is no gold standard to determine which parameter is most accurate. Another possible explanation could be that the adenosine did not reach the more peripheral small airways even though it was designed to reach the small airways, consist of relatively small particles (MMAD of 2.6–2.9 μm) , and was inhaled with a low flow of 30 L/min . Unfortunately we lack information on the exact deposition as radiolabeling for adenosine was not performed and our conclusions are thus based on assumed differential deposition. With respect to AMP-induced dyspnea, multivariate analysis showed no large or small airways parameters that independently associated with ΔBorg. This may suggest that other factors than airway caliber or resistance play a role in the sensation of induced dyspnea. AMP acts on adenosine receptors which are located on various inflammatory cells including mast cells, eosinophils, and neutrophils, and their activation induces a cascade resulting in airway contraction . Adenosine receptors are also found on afferent nerve endings . It could be speculated that activation of afferent nerve endings plays a role in the dyspnea sensation after inhalation of AMP, independent of the presence of airway contraction. This activation may be direct or indirect through bronchial interstitial edema. In the context of direct activation, the findings of Burki et al. are of interest. They administered intravenous adenosine to six asthmatic and six healthy subjects. Both groups reported a significant increase in dyspnea, with a higher intensity of the dyspnea in asthmatics. The FEV1, however, remained unchanged, indicating the absence of airway constriction. Based on these observations, they concluded that afferent nerve endings may be involved in the adenosine-induced sensation of dyspnea, which in asthmatics might be sensitized due to inflammation. In the context of indirect activation, interstitial edema may arise when the adenosine-induced inflammatory response induces alveolar-capillary leakage , which triggers the J-receptors to induce dyspnea sensation . This, combined with the knowledge that afferent nerve endings are mainly seen in the upper and central airways , where we assume AMP primarily deposits, supports our speculation. Although dry powder adenosine and AMP provocation may induce dyspnea through different processes, the degree of dyspnea after the final dose was not different. In addition, both tests were well tolerated and, apart from dyspnea, only led to minor cough in some subjects. This confirms previous findings in a small proof of concept study, that the relatively new adenosine provocation test is well tolerated . We only included current and ex-smokers with asthma. It is therefore unclear whether these findings can be extrapolated to never-smoking asthmatics, as previous studies have shown a decreased dyspnea perception attributed to smoking, in asthmatics . Never-smoking asthmatics may have had greater increases in dyspnea as a result of the provocations, but what this would have done to the association of dyspnea to large- and small airways parameters cannot be speculated. Our study shows that provocation with dry powder adenosine and AMP evoke similar levels of dyspnea. Dyspnea sensation evoked with dry powder adenosine shows small airways involvement independent of large airways involvement, while AMP evoked dyspnea associated with neither large- nor small airways dysfunction. This may indicate that dry powder adenosine and AMP evoke dyspnea via different processes. The authors wish to thank all subjects of the OLiVIA study for their participation and TEVA pharmaceutical Industries Ltd. for their (purely) financial support. Furthermore we wish to thank professor D.S. Postma for her contributions to the study design and her support during data acquisition. This study was supported by TEVA pharmaceutical Industries Ltd., which was in no way involved in study design, writing or reviewing of the manuscript. CC, IB, SV, SS, AL, HF, PH, JV, MF, NtH, HK, and MvdB: full access to study data and accountable for all aspects of the work, data interpretation, critical revision of the manuscript for important intellectual content, and approval of the final version of the manuscript for submission. IB, NtH, and MvdB were involved in the study design. IB and SS performed data acquisition and patient enrolment. AL, IB and CC performed data entry and analysis. CC performed the statistical analysis. JM, HK, and MvdB advised on the statistical analysis. CC, HK and MvdB wrote the manuscript. All subjects provided written informed consent. The OLiVIA study was approved by the ethics committee of the University Medical Center Groningen on March 19th, 2013 and is known under reference number M13.133950. CC, IB, SV, SS, AL, JV, MF and NtH have nothing to disclose. HF reports other from MEDA, other from AstraZeneca, outside the submitted work. PH has a patent on the Novolizer with royalties paid, a patent on the Genuair with royalties paid, and a patent on the Twincer with royalties paid. HK reports that his institution has received grants from TEVA in relation to the submitted work, as well as consultancy fees from Novartis, GlaxoSmithKline, Fluidda, AstraZeneca, and Boehringer Ingelheim outside the submitted work. MvdB reports grants paid to the University from Astra Zeneca, TEVA, GSK, Chiesi, outside the submitted work. The current work was sponsored by supported by TEVA pharmaceutical Industries Ltd., which was in no way involved in study design, writing or reviewing of the manuscript.